There has been some gnashing of teeth lately in the class feed back thread about what we will be using our Chi on. The almighty crab and his design team want us to be using our resources on keeping Shuffle up, and clearing our staggers with purifying brew. A lot of posters want to do more fun stuff. So I’m going to talk about what tanks do now. When the healing model was drastically changed prior to Cataclysm to fast expensive, long expensive, and long cheap heals. 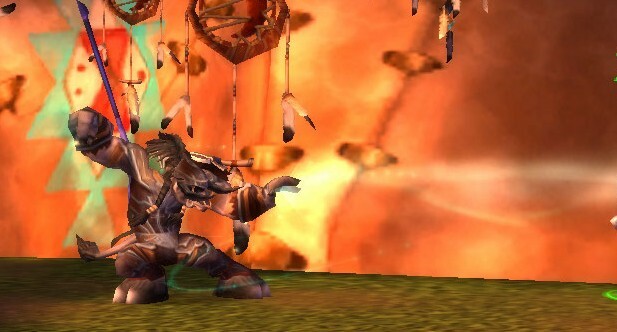 The model used was resto shaman, so the folks healing with waves had an easier transition. The class the new tanking model in Mists is Death Knights. I happen to have had a lot of experience with blood tanking. So not only am I lucky to already have the active mitigation mindset, but I feel I can speak on the subject from fairly solid footing. As a DK all my (err most of my) resources went to stating alive. Frost, unholy, and death runes were almost entirely spent on death strike for the healing it provided and the blood shields it put up. The only exceptions to this being keeping bone-shield up, and the occasional death and decay for AOE threat. Blood runes were only used for heart strikes when Vampiric Blood, Blood tap where on cooldown. Even then we kept on blood rune up hoping to proc another frost or unholy rune. Runic power was the outlier here. We used a lot of it on rune strikes for the threat but it also was our resource for sacrificing our ghoul, Dancing Rune Weapon, and Death Coil healing while lichborne was up. Now after the patch rune strike also gives us more death runes to be used. So on a 2 tank unnerfed raid boss when I had the bosses attention all of my resources were used to mitigate damage/fuel cooldowns/stay alive. There was very little fun/cutesy stuff going on. There was just me doing everything I could to stay standing. When Dartanius ( our trusty paladin main tank) finally taunted big ugly. I would take a deep breath, and priority #1 became getting a blood shield the size of my health pool, then trying to get me resources lined up for when it was my turn to be the most annoying person in the room again. That was DK tanking in raids. It doesn’t sound fun or glamourous, but loved it. Now to compare that to Brewmaster Monks. When we are taking our lumps holding the big bads attention all our Chi is going to be used on Blackout Kicks, Purifying Brew, and Guard. I’m more than fine with that, I look forward to it. It is the model, what else do we use Chi for anyway? (I’m at work so can’t fact check right now) Zen Sphere and Flaming Belch? Zen Sphere is for Mistweavers and surviving big pulls while questing, in a raid environment I expect it to be of little value to us. Flame breath: sure throw it in while the warrior is hitting Garrosh in the groin with a refrigerator door, but it won’t keep you alive when he is aiming Gorehowl at your head. Our mobility, and unique active mitigation are what got me excited about this class. We are working as intended, and this Tauren likes the way we work. I’m with you on this one. I think it’s fine when we have some buttons (like the healing talents, and Breath of Fire) that we don’t always push while tanking. It’s interesting when we have smart opportunities to use those buttons (like sacrificing our personal survival for dps or for others’ survival), but they don’t need to be rotational spells. I’m looking forward to choosing between intense survival and other options, and I think that’s good game design. I think it is important to keep in mind the example i was using was a raid boss that still hits hard. in 5-mans and heroics i think we will have plenty of opportunities to use skills like breath of fire. I recall single Guard’s lasting through entire trash packs in the leveling content. But when push really comes to shove i like our chances with the skills we have.